Lakeside Clinic's GE Lunar Prodigy DEXA scanner provides information on bone mineral density, and helps your provider to diagnose and treat osteopenia and osteoporosis effectively. A DEXA scan is painless, brief (about 15 minutes), and routinely covered by most insurances for postmenopausal women and others with qualifying conditions. 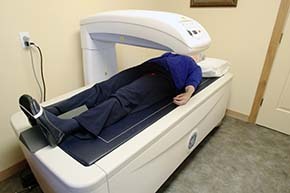 Your DEXA scan can be scheduled immediately following your annual physical exam and compared with previous scans. Lakeside's xray equipment is versatile enough to provide imaging of the skull, chest, spine, and extremities (arms, legs, hands and feet). 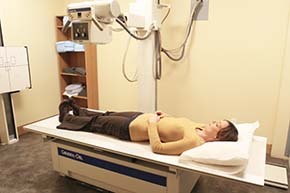 Lakeside employs persons fully certified and licensed to perform xrays for accurate and timely interpretation. Your xray will be viewed first by your provider, then transferred to Northwest Imaging for review by a qualified radiologist. In addition, your specialist provider is able to view both your xray image and the radiologist's interpretation. 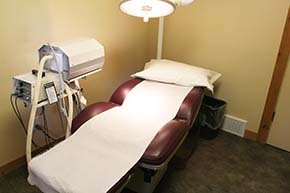 In Lakeside Clinic's treatment room, a padded adjustable table supports your body while your wounds are being cleansed and closed with sutures and bandages. Surgical lighting helps your provider to see and repair quickly. Lesions such as warts, moles, and skin tags can be quickly and effectively cauterized and removed using our Ellman Radiofrequency Unit. We can have you fixed up in no time and back to enjoying our beautiful Flathead Valley! 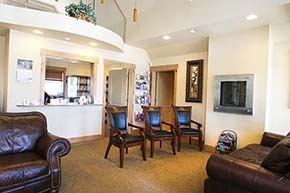 The Lakeside Clinic has served the residents and visitors of the communities of the Flathead Lake area for over ten years. While several physicians have been associated with Lakeside Clinic over the years, the clinic has always been independently owned and operated by Family Nurse Practitioners. The clinic offers primary and urgent care including routine exams, X rays, DEXA scans, suturing and minor procedures, as well as routine care of common conditions e.g. diabetes, hypertension, and high cholesterol. Its mission is to provide the most comprehensive, compassionate, and cost-effective care possible to its patients. Nurse Practitioners bring a unique approach to health care. They have a higher level of patient satisfaction with outcomes comparable to or exceeding those of physicians. They encourage healthy lifestyle choices and self-care. They are licensed independent providers, fully capable of providing a medical home for patients with complex conditions through coordination of care with specialists in the fields of orthopedics, cardiology, pulmonology, and surgery. One of Lakeside's specialties is hormone evaluation and replacement therapy. Men and women both experience hormone decreases with age and stress. While an expected part of aging, low hormone levels cause uncomfortable symptoms for many and diminish our enjoyment of life. Lakeside Clinic supports the use of bioidentical hormone replacement strategies and monitors their effectiveness regularly. It is a gateway to Lakeside Wellness which provides Sottopelle bioidentical hormone pellet therapy.